This is a story book and guide to snorkelling all in one. 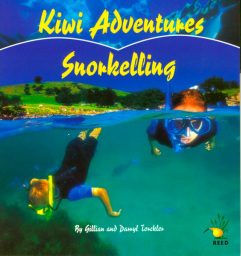 Read the story of Joseph and his sister, Jessica, who are learning how to snorkel safely in their school pool, in preparation for a snorkelling trip to a local marine reserve. Follow them as they learn to duck dive under the water, to communicate with hand signals underwater and all the dangerous creatures to avoid. They learn how to choose correctly fitting masks and snorkels. One the day they arrive at the reserve, they learn how to enter the water safely. The book was photographed at Goat Island Bay, which is not far from where we live. It is a fantastic place to snorkel and dive. This was New Zealand's very first marine reserve and as a result there are lots and lots of fish. Nearly forty years of protection have seen their numbers grow hugely. "Author and illustrator are well-respected writers and photographers on marine subjects. Their passion and experience for water sport show throughout this beautifully presented book.